Hop on this fantastic minibus tour and see the most beautiful areas of Iceland's South Coast, including the "Crown Jewel of Iceland", Jökulsárlón glacier lagoon and the nearby Diamond Beach. This is the perfect tour opportunity for those guests looking to experience the very best of the South Coast in one single day. Your adventure begins with a pick up in Reykjavík, from where you'll head towards the beautiful Seljalandsfoss waterfall. Waterproof clothing or a raincoat are smart choices here as this waterfall is famous for being accessible from behind, providing a unique perspective on one of the country's most beloved features. Your next stop will be at Skógafoss, a 60-metre high waterfall where it possible to view from both top and bottom. Continuing along, you will next visit the coastal village of Vík for a quick lunch stop. This beautiful settlement lies on the banks of the exquisite black sand beach, Reynisfjara. Here, you can look upon the enormous Reynisdrangar rock stacks that emerge from the ocean, appearing like some huge mystical creature. 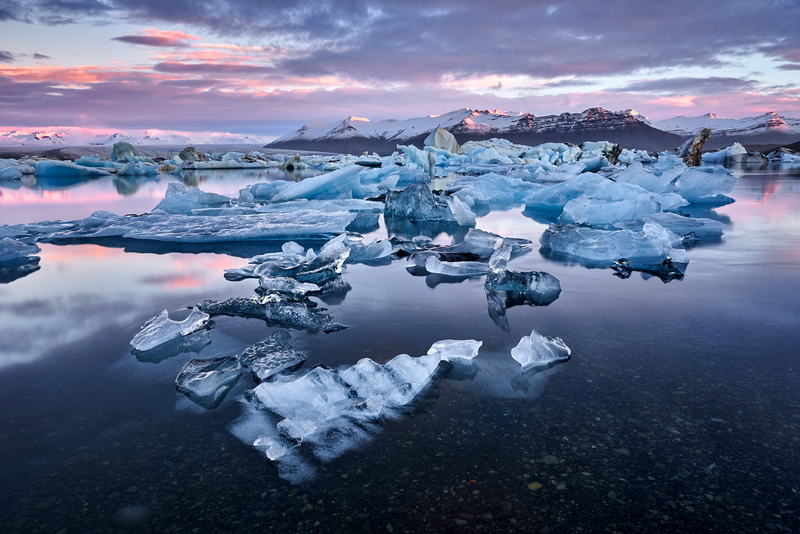 The journey proceeds as you approach Skaftafell Nature Reserve to the stunning Jökulsárlón glacier lagoon. Once you arrive at the lagoon, you will be able to see the magnificence of Iceland's water in all its forms; massive blue and white icebergs break away from the outlet glacier, Breiðamerkurjökull, floating gloriously on the lagoon's clear, still surface. If you're lucky, you might even spot some of the resident seals who call the lagoon home! Just across the road, you will be able to walk along the fantastic Diamond Beach, a strip of shoreline where the icebergs from Jökulsárlón wash up onto the volcanic black sand. This natural vista is beloved by nature lovers and photographers alike, who stand in awe of this fantastical and ethereal place. Throughout the experience, you will be travelling in a comfortable minibus, complete with Wifi and an Icelandic music playlist, as well as enjoy the company of a professional tour guide, who will proceed to educate you on the country and its attractions throughout. Hurry now and you too can experience the majesty of Iceland's South Coast, including waterfalls, black sand beaches and glittering glacial lagoons. Check availability by choosing a date. Please be at your pickup location in time for your departure. Pick up might take 30 minutes. Read carefully if you will be picked up at your hotel or at the nearest designated area (Bus Stop). For walking distance to bus stops, please check busstop.is. Pick up is available from designated areas in Reykjavík city. You can bring some favorite snacks and beverages if you like. There will also be a lunch stop. We really enjoyed this tour, only real negative was that it was raining really bad the day we did it so got absolutely soaked. Highly recommend taking a change of clothes or wearing good waterproof pants. Our tour guide took us to a waterfall where you can walk through the crack in the rock face and it was stunning, definitely worth getting wet. If it had been better weather I would have spent more time at diamond beach to be up close with it all. Was still a beautiful day, great tour and would recommend if you aren't able to spend more than 1 day down in the south. We enjoyed the tour very much. The tour guide, Boris, gave us adequate time at all the attractions on our route and was knowledgeable about Iceland. Great tour. It was a very long and full day, but we were given lots of time to get out and explore the sights, and made frequent stops to stretch. The guide was excellent. Very knowledgeable and shared lots of stories adding a personal touch. It's definitely worth the drive to see the iceberg lagoon. This was the best day! 14 hours sounds long, but it really didn’t feel like it to me! Saw everything I wanted to see and it was better then I expected. Great tour if you only have a few days in Iceland, or if you are traveling by yourself. The guide David was really nice and even drove me home after ( it was late) and I was staying outside the city! Really, really nice day! Can’t reccomend it enough. This tour gives you a look at the two extremes of Iceland volcanic made and the frozen glaciers. It's a long day, worth every minute. Most people take it as a 2 day trip. The tour is offered separately from a 30 minutes Glacier boat ride (recommended). Don't buy tickets to the boat ride until arriving to the site because the reservation is by exact time of arrival. You may buy tickets from reputed websites like Guide to Iceland, but there are actual tour operator on the ground. Our tour operator was Tröll Expeditions, and they gave us old mini van and the driver had rough time with it. This tour exceeded our expectations. We started the day early making it to our first stop with very few people there. This allowed us to take our time taking in the beauty as well let us take some great pictures without too many people around. We had a rainy Iceland day for most of the tour but the sun came out towards the end of the day which was so amazing and the rain never stopped us! Every stop on this tour was so unique. I really feel like we saw so many different things from this beautiful country from waterfalls, to glacier lagoon, to out of this world lava fields. Each spot equally interesting in its own way. The amount of knowledge that Vada shared with us was so appreciated. She shared history, interesting stories and was able to answer every question any of us had. I highly recommend taking this tour, especially from Vada, you will not be disappointed! I highly recommend this tour. Had a really good time and learned a lot about Iceland in one day. This tour had everything that I really wanted to look at in Iceland and it did not disappoint. I was so happy with my guide Sol. He was always telling funny and smart stories about the places we drove past and I really feel like I know a lot more about Iceland then I could've hoped for. Highly recommend!! I had such an amazing time on this tour! The highlight for me was the Jokulsarlon and it was such a beautiful sight! I was just amazed by the nature there and then we went to the diamond beach on the other side and that was just breathtaking. The whole day was just one of a kind and I couldn't hope for a better time! I highly recommend this tour. This is a tour de force of all the best sites in the south of Iceland. I feel blessed to have been taken through all these amazing wonders of nature by the very knowledgeable Sighvatur. He has the gift of making the complicated natural history of his home country clear and understandable. Thanks Troll and thanks to Sighvatur for this unforgettable trip! This tour had pretty much all the sights I had hoped to see in Iceland for a short period of time. I only had 3 days in Iceland and that's why I picked this tour, it goes to so many places and you really avoid the crowds so you feel like you are alone in the majestic Iceland!! I really recommend this tour! This tour is so wonderful! I was so lucky with our small group and made some amazing new friends! Our guide Sol was so nice! You could see that he enjoyed being a tourist with us in his beautiful country! I've been on other trips in Iceland but I would say this one is a must see. I was amazed by all the scenery and had a wow moment at every location! I did this tour with Siggi who is a 100% Troll but lives amongst humans. The tour was wonderful and every 15 minutes there is something magnificent to see and Siggi told us stories of his TrollTribe and hidden people and kept us energized with music and humour all day. I felt safe and comfortable, was a little scared at somepoints, I am not use to walking in nature but Siggi took great care of me and made sure I did not miss a thing. Thank you Siggi Troll and Troll Expeditions for the best day of 2018 so far. This tour was a full day 14 hours that I will never forget. The view of the marvellous scenery and interesting places kept my eyes wide open at all times. There were many stops on the way and our guide made the journey so enjoyable by telling us all about the areas we were visiting, the history of the country and the culture of the local communities because she was from Höfn. My favorite things about that was learning about the struggles that the local communities have been through over the years. Nature can be beautiful but also challenging and every place you visit has a tale, which is why I loved taking this tour with Tröll Expeditions. My guide Maggie could not have been more thoughtful and knowledgeable. THANK YOU! I give this tour 6 stars! This was the highlight of our time in Iceland. We normally do not choose to travel in groups but decided to give this tour a try. We were not disappointed, this tour covered the best parts of the Icelandic South Coast. We even went on a glacier walk with this amazing guide Siggi The tour was very well organized, we had good time at each stop. Got to take some fantastic pictures. I would recommend this tour to all of my friends. An amazing tour even though it was raining and a bit windy. Our guide María was really helpful and told us many stories about Icelandic history. I always felt safe and really enjoyed every part of the trip. A rainy day that was one of the best days of our Iceland journey. Maria was the star of the show, she was amazing and the best guide I've ever had. We had a great day on this tour with Troll, and our new best friend Dagur. Who is an awesome guide, the day was quite long but it was worth it since we didn't have a lot of time in Iceland. We saw all the sight, Reynisfjara the black sand beach and the glacier lagoon were both amazing. For all who have only few days to spend in Iceland I would recommend this tour.